Looking through bakery shop windows, you immediately salivate when you see those gorgeous looking cupcakes with their fancy frostings. This makes you want to instantly buy a couple and gobble them all up. More often than not, the lure of cupcakes start with these elaborate designs. So if you want to make your own creations appealing, it is important to enroll in some cupcake decorating classes. Remember, though, that practice makes you perfect and there are some techniques you develop on your own as you go along. Here are some basic tips from seasoned cupcake artists. If you’re not really a great baker and have no special recipe for the yummiest cupcake but you still want to make themed cupcakes for your kid’s special birthday, a no-fail method is to just grab one of those boxes of pre-mixed cake batter. All you have to add are a couple of eggs, maybe some oil or water and you’re set to bake them. Once you have your base cupcake ready, you can head in for the more creative work of decorating them. 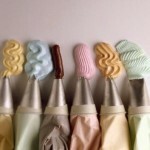 The beauty of swirls on top of cupcakes all depends on the kind of tip you use on your piping bag. For really big swirls, use the extra large tips such as the French star or the open star. These are perfect for making elegant flower-like icing on top of the cupcakes. To make little rosettes, use the closed star tips in small sizes. Cupcake decorating classes can show you more of the intricacies of cupcake decorating such as how to create really elegant looking designs. Cupcake Decorating Classes: Buttercream, Royal or Fondant? There are several types of icing used to decorate both cakes and cupcakes, each with its own benefits. The most common among them are buttercream, royal icing and fondant. Buttercream is the most basic and all-purpose icing that any beginner cupcake maker should learn to make. It has a very silky and stable texture so it spreads nicely on top of cakes, and holds its form well. It is versatile enough to be used as smooth icing to cover the cupcake and add borders and decoration such as leaves and flowers, as well as to write wordings. Royal Icing is the kind that hardens after a period of time. This is the type of icing used in making flowers, figures and in decorating sugar cookies. Fondant is the type of icing that provides a smooth and satiny surface. It is also most commonly used in making complex figures because it is can be easily molded and cut. Now you have the basic knowledge, all you have to do is practice the different designs that you see in the shop windows. But if you aspire to really be a great cupcake baker like the DC girls, it’s best to enroll in cupcake decorating classes to get all the information and practice that you need.